Welcome to Serenity Sanctuary in Pigeon Forge! 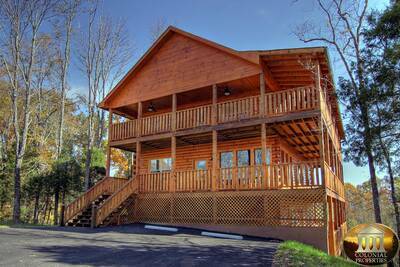 This amazing 5 bedroom, 5.5 bath cabin rental has all of the comforts and amenities to make for an unforgettable Smoky Mountain vacation getaway! On the main level of Serenity Sanctuary is the first of two luxurious king suite bedrooms. Here you’re treated to a flat screen TV, private deck access, an en-suite full bath with jetted tub and a walk-in shower with a rainfall shower head. Here at Serenity Sanctuary you’ll have your very own in-cabin home theater with movie seating and surround sound. This is the perfect place to watch your favorite movie, TV show, or sporting event on the big screen! Also, if you’re looking for a little fun and excitement, there’s a shuffleboard table and an arcade game featuring over 50 of the most popular arcade games of all time. 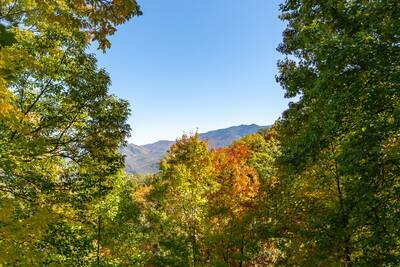 Serenity Sanctuary offers you and your guests breathtaking outdoor space to enjoy the amazing Smoky Mountain views. With its countless amenities, strict attention to detail, luxurious features, and stunning mountain views, your time at Serenity Sanctuary will be something that you will forever cherish. Plan your vacation getaway here today! A: Hi Lashanta, it does not have a pool table. These gaming amenities are currently listed: Multi-Cade Arcade, Shuffleboard, Table Top Arcade Game. A: One small step to the main entry. A: Hey Brandy. It has 4 Kings, 2 Full bunk bed sets & 2 sleeper sofa's. The kings sleep at total of 8, the bunks sleep a total of 8 for 16 & and sleepers a total of 4 for a grand total of 20. “ Absolutely beautiful, the family an I had a wonderful time together especially with our grandchildren. The cabin is wonderful and very accommodating, we will be back soon. “ Thank you for allowing us to stay in your cabin. The cabin and view are absolutely beautiful, great family memories have been made. “ Serenity Sanctuary, was a wonderful experience and a fun two nights stay. We had five families and we all were very comfortable. The view in the morning was amazing, our children loved the hot tub, arcade game, and theater room. We definitely will be returning, wish we we would've stayed longer. “ Thank you for leasing your beautiful home to us. We had a wonderful experience, and relaxing time while staying in Serenity Sanctuary. The cabin provided all the amenities, and space to accommodate all 20 of us. We will definitely be back !!!! “ The entire country the we have had the privilege to live in is beautiful, however, your piece of it is blessed beyond measure! We thank you for your hospitality and gracious accommodations, we will be back soon for sure !!! “ We had a wonderful time! We have not been here in about 14 years, and couldn't have had a better time in your beautiful home. Thank you again! “ Enjoyed staying at the cabin. Everything was very pretty, especially the views. “ How blessed we have been to stay here! God's glory can be seen all around, inside and out. Thank you so much for your hospitality and this beautiful cabin! “ Thank you for opening up your beautiful home to our family. We have truly enjoyed the space, the views, and the time spent together as a family, each room was truly beautifully arranged and very accommodating. We look forward to many more trips here. Thank You again !!! “ We loved it. It was a great experience. “ We had a fantastic time on our vacation here in Tennessee. Thank you so much for this wonderful cabin it's beautiful. After a long day of riding our motorcycles we really enjoyed the peaceful environment Serenity Sanctuary provided. We will forever remember this trip. We wish you all the best in hosting future guests and hope they enjoy their time here as much as we did! “ This was by far our favorite cabins. The cabin was very cozy, roomy, and beautiful we loved the view from the deck, we will definitely be back. “ Thank you for allowing us to stay at your cabin. The cabin and the view are absolutely beautiful, we made so many great family memories.